If you’ve never been to Baguio City, then you’d best put this one in your bucket list of places to visit in the Philippines. Known as the “Summer Capital of the Philippines”, this wonderful city boasts of cool temperatures and exciting landmarks for tourists to enjoy. It may not be the highest point and coolest place in the country but it is the coolest city. Air conditioning is rarely needed even on the hottest summer days. A highly urbanized city, there’s a lot to enjoy in Baguio. It also helps that the city’s economy centers on tourism, providing tourists with a plethora of exciting activities to enjoy and wonderful places to explore. The city is accessible by air via the Loakan Airport, allowing travelers to reach the city within a few minutes from Manila. Still, the preferred transport choice is via bus or private vehicles especially because the city is only around 6 hours from the country’s capital. Also, the zigzag road along the way is an attraction by itself, allowing tourists to also enjoy the stunning views as a plus while having fun in the road trip. The area where Baguio City now lies, then called as Kafagway, was part of a territory first settled by local Kankanaeys and Ibalois. In all the years that the Spanish occupied the Philippines, that place remained quite untouched. It was only when the Americans came to the country that someone noticed the potential of this magnificent place. Officially declaring the place as the “Summer Capital of the Philippines”, the Americans built a road to easily connect it to Manila. Throughout their occupation, all the Americans would escape the sweltering heat in the capital during the summer months by temporarily moving to Baguio. It was also at this time that the Mansion House was built as the summer home of the American Governor-General (later turned over to the Philippine President). The city is also permanently etched in the history books as the place where World War II officially ended. It is the site of the formal surrender of the Imperial Japanese Armed Forces to American authorities. Although there are still a lot of native people living throughout Baguio City, it is easy to see that this beautiful place has become home to several immigrants – domestic and international alike. Foreign languages like Korean, English, and Chinese seem to have crept up across the city in signage and posters to accommodate the growing population of foreigners. Still, local dialects like Tagalog, Kapampangan, Pangasinan, Kankana-ey, Ibaloi, Ifugao, and Ilocano continue to dominate across the city. The city has a rich culture and is a haven for artists throughout the years. In fact, this cultural richness has produced a number of homegrown talents who’ve made a name for themselves for various art fields. Also, the National Artist Ben Cabrera and other well-known personalities were drawn to the city, relocating or establishing a home in this beautiful place. The annual Panagbenga Festival (Flower Festival) is held in February. It is considered to be the best time to visit the city. This remarkable festival showcases the beauty of the flowers grown across Baguio. Majestic floats decorated with thousands of different flowers are paraded across the main streets while dancers decked in flower-inspired costumes also offer a stunning display of grace and beauty. 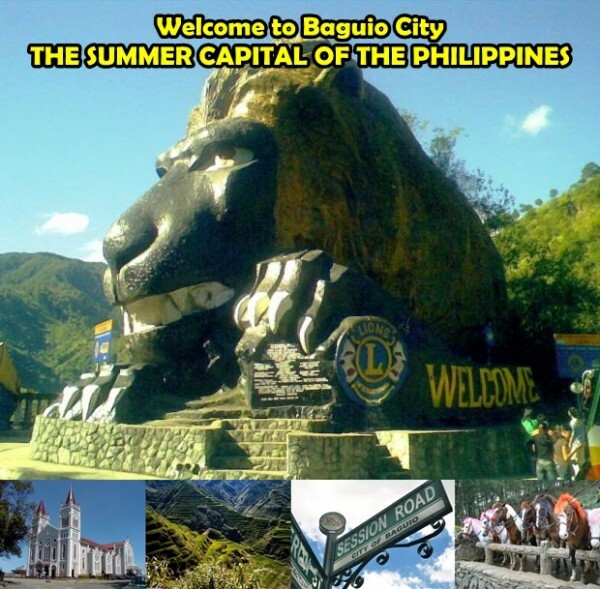 Truly a wonderful place to visit, Baguio City is a joy to explore. There’s a lot to learn about this historic and beautiful city. Don’t miss visiting the popular tourist spots. Bring home fresh fruits, flowers, and vegetables from the market. Also, don’t forget to buy exquisite souvenirs that showcase the craftsmanship of the local people; these include hand-woven fabrics and silver jewelry. Pingback:Businesses in Baguio City | 2ngaw!